A copper alloy probable fob or mount of Late Iron Age to Early Roman date (200 BC-AD 200). The fob is formed of four interconnected and spiralling arms that curve round to lay on the inner curve of the adjacent arm, resulting in teardrop-shaped openwork elements within each spiralled arm. The centre of the object has a circular cell, now empty, which would have held enamel. Each arm has a projecting circular knop at the terminal which have integral curvilinear lines which give the knops the form of a highly stylised flower. 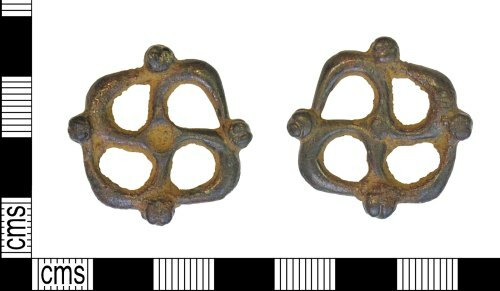 The reverse of the object has a small, projecting, broken spur which would have formed a suspension loop. The metal is a dark brown in colour with a smooth patina. Fobs or danglers remain a poorly understood artefact type, and may have been hung from items of equipment, personal apparel or harness decoration (Jope 2000:285). Width: 29.60mm, Height: 28.90mm, Thickness: 6.79mm, Weight: 9.7g.